This lab assumes that you are familiar with the (very) basics of HyperText Markup Language (HTML) and that you can read and create (very) basic HTML documents. In case you do, please advance to Lab Start. In case you do not, take a few minutes to work your way through this preamble and make sure that you have a basic idea of HTML before progressing to the actual lab. then stick this text in a file named foo.html and pick this file up with your web browser (Control-o will pop up a file dialog with which you can select your HTML file), you can see how the web browser renders this HTML. !!! IF YOU HAVE NEVER DONE THIS, PLEASE TRY THIS OUT NOW !!! is incorrect. (It is true that most HTML rendering engines are sufficiently smart to detect this type of error and correct for it, but you should try hard not to make the error in the first place. Especially when we start working in XML (another markup language discussed and practiced later in the course), this type of error can come back to bite you hard. Oops... no HTML 5 canvas support. 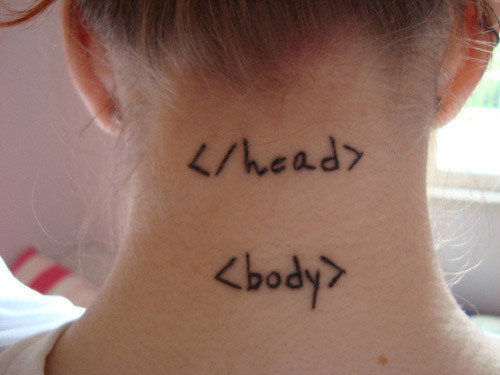 If you are unfamiliar with this HTML markup, you might want to experiment a little with it. A good place to do this interactively is w3schools' interactive HTML renderer. This lab familiarizes you with the Linux/Apache/MySQL/PHP web stack. We will write some PHP programs and deploy them on a (ONID) Linux machine running the Apache web server. MySQL relational database management system. PHP (PHP Hypertext Preprocessor) programming language. You have HTTP access to the materials in your ~/public_html directory through http://oregonstate.edu/~your_ONID_login. Hello, world; I can see that you all can see me. !!! If you cannot see your public_html folder, consider switching on the File name extensions and Hidden items options in your file browser !!! !!! Do not continue with this lab until you are convinced that the above connections are working properly for you !!! PHP is an interpreted programming language which is quite popular on the web. PHP, however, is not at all 'tied to' the web. It is a programming language all by itself and works well on the operating system (OS) level. When used on the web, the web (HTTP) server, receiving a request for a PHP file, calls the PHP interpreter, pointing it to the PHP file requested by the HTTP client and grabs hold of the interpreter's output; be it HTML, XML, text, etc. The interpreter's output is then routed back over the Internet to the HTTP client. For instance, in your browser, pull up http://oregonstate.edu/~reitsmar/info.php Notice how this is a request to the web server located at oregonstate.edu to run the program info.php which itself generates HTML output. Indeed, when you pull up the page source (right click—>View Page Source), you will see that the page, as delivered to your browser is in straightforward HTML; it contains no PHP. !!! Make sure you understand the above process. This entire lab is built on this architectural principle. If in doubt, please ask your instructor !!! To get started, we will write a tiny PHP program that tells us what version of PHP and which PHP settings we are actually running. The program contains just one thing; a call to the standard PHP method php_info(). This method generates an HTML version of the server's configuration data. We are running PHP version 5.2.10. System admins configure PHP through an initialization file that gets read by the PHP interpreter: The one listed here: /etc/php5/apache2/php.ini is the one used by the PHP interpreter as it's invoked by the Apache web server. memory_limit: 64 M (ONID does not allow you to run PHP applications that require more than 64 MB of memory). max_execution_time: 30 seconds (ONID does not allow you to run PHP applications that run for longer than 30 seconds). Notice that /www/httpd-docs is the so-called document root (see _SERVER["DOCUMENT_ROOT"]); i.e., all files referenced in a URL including this server reside off of the /www/httpd-docs directory on the file system (recall that we discussed this during our HTTP lectures). Finally, see how in the Environment table the default HTTP response headers are listed. Run this program and look what it does to the top of the page rendered in your browser. The PHP code, very much like what we will see in ASP.NET, is embedded inside HTML code. As the PHP interpreter processes the code, it will output all HTML unaltered and will process only the segments delimited between <?php and ?> as PHP code. Since the web server takes the output of the PHP interpreter and routes it straight back to the HTTP client, the HTML and executed PHP get 'fused' together into one, coherent HTML document (see page source). Since PHP is a full-featured programming language, it supports programming constructs such as variable assignment ($i = 1), arithmetic expressions ($i <= 10) and looping (for...). It supports function/method calls; e.g., print(). Statements are separated from each other (delineated) with semicolons. Groups of statements that must be treated as a single block must be grouped in curly braces (see the next program). A for loop has its initialization, stopping condition and increments all defined in parentheses at the start of the loop. while and if conditions are specified in parentheses. Problem: Can you modify the code so that PHP does the numbering itself? (i.e., that it does not rely on HTML's <ol> facility for numbering the lists' items). Check the page source and make sure you see the difference between this and the previous HTML source. Finally, !! !and most importantly!! !, notice that in our PHP program we never declare i to be an integer!!! In fact, unlike as in C, C++, Java or the .NET languages, we pretty much never explicitly allocate any memory for our variables. In jargon: PHP is a weakly typed language. Most interpreted languages are weakly typed. What this means is that since the interpreter 'postpones' translating the source code into machine code until the very moment that a specific line must be executed, it can make memory allocation decisions on-the-fly and does not have to rely on the programmer to specify those. For instance, when the interpreter reads the code '$i=1', it can decide that 1 is an integer and allocate just the right amount of memory for i to hold that integer. Research has found that programming in interpreted languages goes much faster than programming in compiled languages (of course, compiled languages execute much faster). Why goes programming faster? Because programmers do not need to worry about allocating memory and therefore do not have to declare variables to be of specific types or convert between data types. my_array is an array of mixed data types!! It contains an integer (1) at position 0, a float (-99.99) at position 1 and a string ("mystring") at position 2. At no point do we have to declare the array's datatype or length!! Not only that, we can apparently freely mix data types. Notice how the print() function concatenates ('.') strings that are not even strings; e.g., $i+1 is an integer. But since the translation into machine code is postponed until the interpreter knows exactly what is stored in $i, it can, on-the-fly, convert it into a string at the time it does the string concatenation. Similarly, once the nonstring elements of my_array must be printed, the interpreter will convert them automatically to strings. Too good to be true? Well, to some extent is is a little too good. Why? Although not having to think much about data types and memory allocation makes programming faster, it also makes it 'easier' to confuse matters and leave too much decision making to the interpreter. This can cause hard-to-diagnose run-time errors. Hence, you may gain some time writing the program, but you may lose some of that time later when debugging it. Notice how we are sending the HTTP Content-Type: header, letting the browser know that we are sending an image. Now comment out (//) the call to header() and run the program again. Can you explain what's happening? Request the add_form.html page in your browser, fill out the form and hit the add... button. Two text inputs named Fnumber and Lnumber. One input field which is of type 'submit' (a button). Notice that we define the form's action—gets called when the Submit button is clicked—as a link to ~your_login/public_html/add.php. How do we communicate Fnumber and Lnumber to add.php? All the values of all input fields in the form will be automatically passed to add.php. In the form, we declare that we use the HTTP GET method when submitting the request to http://people.oregonstate.edu/~your_login/add.php. In add.php, we pull these parameters out with $_GET[parameter_name], and assign them to local variables. Modify the form to use the POST method. Modify the PHP code by replacing $_GET with $_POST. Notice how everything works just fine, but that Fnumber and Lnumber are no longer passed in the URL. Instead. $_POST pulls them from the body of the HTTP request. Finally, notice that $_GET and $_POST are what are called associative arrays; you can access their elements by name; e.g., ["Fnumber"] and ["Lnumber"] rather than by index (, , , etc.). Replace add.php with the above code and run it. Notice how in the PHP code section of the page we check to see if we received values for Fnumber and Lnumber — if ($first && $last). If so, we print the sum and exit. If not, we don't do anything but let the PHP processor process the rest of the page which is the HTML for the form. The above two 'form' codes provide examples of how, in PHP/HTML we can maintain 'state' between consecutive HTTP requests. Recall that since HTTP itself is a stateless protocol and therefore cannot maintain state, we need auxillary mechanisms to maintain state between consecutive interactions with a web server. Take the example of playing a Tic-Tac-Toe game where each move made would have to be processed server side. Clearly, you would have to maintain state. After all, if on the server side we would lose track of which player occupies which field on the board, the game could not be played at all. $cells[$c] = $_GET[$c + 1]; //$_GET is an associative array of URL parameters. Study this code carefully; it has all different kinds of goodies in it. Parameters 1-9 maintain the state of the board's nine fields. The number of played moves is kept in the parameter move_count. Who is on turn is kept in parameter turn. Whether a move is valid is kept in a parameter valid. Notice that whether or not we have a valid move is a state variable because we want the PHP program running server-side to determine whether or not we have a valid move. We then must remember this for the next call. Invoke a fresh game and before playing any move, inspect the page source and the settings on the hidden input fields. Notice that all board fields are empty; that CROSS (1) is on turn; that the move_count = 1, and that we are assuming an invalid move. Make one valid move and look at the new page source. Notice how the state variables change value accordingly. Make a few more moves, checking the page source after each move. In summary, since HTTP is stateless, we must maintain the state of the game 'outside' of HTTP. One way of doing this (we will see another way later), is by passing the state of the game by storing the entire state in our HTML page as hidden input ('memory-on-the-go'). That way, it goes back and forth between browser and server and the PHP program on the server can access the state variables through its $_GET array. In the PHP program itself, we use if statements to decide what to do depending on the values of the state variables. !!!Note!!! This business of maintaining state across consecutive visits to the server is crucial for web programming. It is also the thing that makes web programming more complex than standard programming. Make sure (!!!) that you understand how and why this works!!! On the server side (inside the PHP program) we keep the state of the board in a one-dimensional array called $cells. Next, for all cells ($cells through $cells), we set them to each of the values from parameters 1-9 which you get from the $_GET array (similar to the Fnumber and Lnumber parameters in the addition example earlier). Notice again that although the _$GET array is associative and we index into it with strings, we can index into it just as easy with integers; the interpreter will do the needed conversions for us. Carefully study the code. The hardest part of maintaining state across different invocations of the program is determining the order in which different blocks of code must be executed. This state maintenance business is different from what we have seen in our BA371 labs and it takes a bit of a different mindset. Do not give up if at first you do not quite see why this PHP version of Tic-Tac-Toe actually works; try grasping its logic. Cookies are another way of maintaining state. With a cookie, the state is not passed back and forth in the HTML page, but is temporarily stored on the client. Whenever the client submits an HTTP request to the server, the cookie and hence, the state information, is sent along with it using the HTTP cookie: name=value header. Let us write a few small programs that 'register us' on our own web site by giving us a cookie. Then, when we later go back and visit our site again, the cookie is read back from the browser and the server welcomes us back to the site. Now request ask_for_cookie.php and follow the links. In ask_for_cookie, we use straight HTML (no PHP at all!) to collect first and last name. These are then passed to set_cookie, who reads them from $_GET and sends them back on the browser as cookies (setcookie()). Note that the cookies are set to expire in 1 hour (3600 seconds). get_cookie.php reads them from the cookies held by the browser ($_COOKIE). Use the facilities in your browser to find the cookies; they're still there (in Chrome: chrome://settings/cookies (look for people.oregonstate.edu)). Extract the results, one record at a time. Write them to the HTML page (or do something else useful with them). In this example, we will run against (y)our own ONID-based MySQL database. We willll first create a customers table and populate it with a few records, so we have something to query from PHP. Log into ONID at http://onid.oregonstate.edu —> Login to ONID. Select Web Database from the menu. Note the authentication data for connecting to your own, private MySQL database in the Current ONID Database Settings table. Connect to PHPMyAdmin, a web-based tool for administrating your MySQL database, at https://secure.oregonstate.edu/oniddb (login with your database username and password given to you in the previous step). Select your database in the left-upper corner. Click the SQL tab to get access to the SQL command-line tool. To create the customers table and fill it with three records, enter the following SQL and hit the Go button. Select the customers table from the menu and hit the Browse tab. Notice how the table and its three records now exist. Also, once again you can see how the weakly-typed nature of PHP makes the code very tight and short; just move your data around the needed functions and assignments and do not worry about casting and type conversions.